THE GOOD: In Trailhawk trim, the 2017 Jeep Grand Cherokee boasts impressive offroad equipment, from the Quadra-Trac II 4×4 system to the Quadra-Lift air suspension to the simply rugged underbody cladding. The Uconnect infotainment is pleasing to use and well-featured. Advanced driver aid features, such as adaptive cruise and parking assist, are just an options package away. THE BAD: Uconnect infotainment lacks Android Auto or Apple CarPlay connectivity. Parts of the interior feel a bit plasticky and hollow. 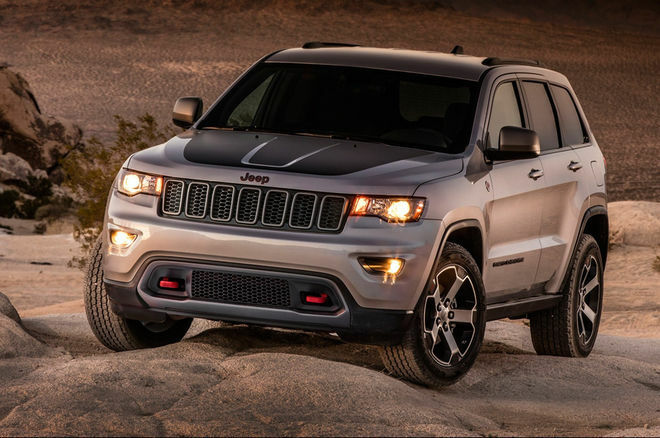 THE BOTTOM LINE: The 2017 Jeep Grand Cherokee Trailhawk feels like the sort of SUV that you can actually use offroad and get dirty without feeling too precious about it, but it also boasts a surprisingly sophisticated loadout of driver aid and infotainment tech. 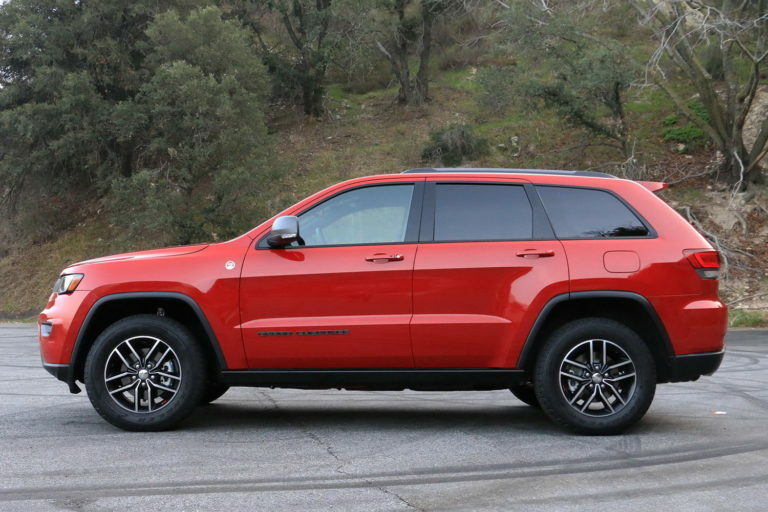 Having enjoyed first the surprisingly capable Jeep Cherokee Trailhawk and then the Jeep Renegade Trailhawk, I set my bar high for the big-boy Jeep Grand Cherokee Trailhawk. Fortunately, the largest Jeep SUV largely met my expectations — even as this review came hot on the heels of weeks spent in the Land Rover Discovery and BMW X5. Those vehicles are perhaps a bit more high-brow than the rugged Trailhawk with its bright red tow hooks and aggressive hood graphics, but the Jeep proved capable, comfortable and surprisingly high-tech for a toy you’re meant to get dirty. Overall, I was left with the impression that the Trailhawk wasn’t just a beefy 4×4 that can throw mud with the best of ’em, but also a balanced SUV that’s just a capable on the commute. Pop the hood and you’ll find FCA’s 3.6-liter Pentastar V6 engine, the workhorse of Fiat Chrysler’s North American lineup. In this incarnation, the naturally-aspirated V6 makes a respectable 295 horsepower and 260 pound-feet of torque which gets sent through a single option 8-speed automatic transmission on its way to the wheels. The addition of Engine Stop Start (ESS) technology helps to reduce fuel wasted to idling for this generation and contributes to the also respectable 18 city and 25 highway mpg economy estimates. My tested average of 16.9 mpg fell a bit short of those averages, but that’s expected given the unique rigors of the review and production processes. 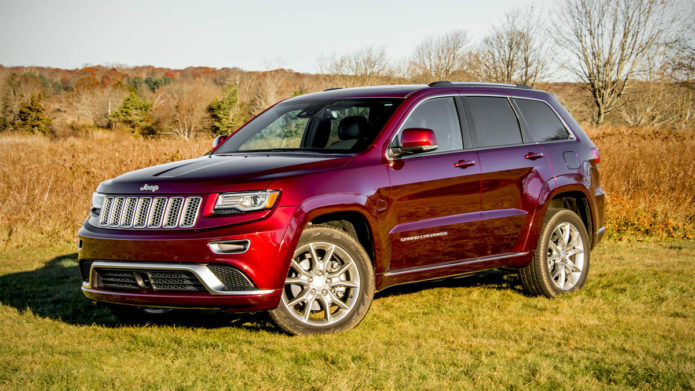 The 295 horses help the Grand Cherokee to accelerate confidently on the highway, but this is no neck-snapper. Decent gearing help the SUV to feel responsive around town. Those who know they’ll want more power (or more specifically maximum torque for offroad crawling) should consider the optional 5.7-liter V8 engine upgrade, which steps up to 360 horsepower and 390 pound-feet of torque. And the truly mad can step up to the ridiculous Jeep Grand Cherokee Trackhawk, which trades all offroad ambitions for 707-horsepower and street performance. There exist many 4×2 rear-wheel drive and 4×4 four-wheel drive variants of the Grand Cherokee, but the Trailhawk in question features a standard Quadra-Trac II system, the best available to this body type. Quadra-Trac II upgrades over the standard 4×4 setup with a two-speed transfer case with low range capability for high-torque crawling and more advanced sensors to detect wheel slippage. As needed, up to 100-percent of available torque can be shifted to the front or rear axle, depending on where the most grip is available. The Trailhawk also features Jeep’s Selec-Terrain traction control system which allows drivers to select between terrain presets — Snow, Sand, Auto, Mud or Rock — to adjust the behavior of the powertrain and all-wheel drive systems for specific driving conditions. 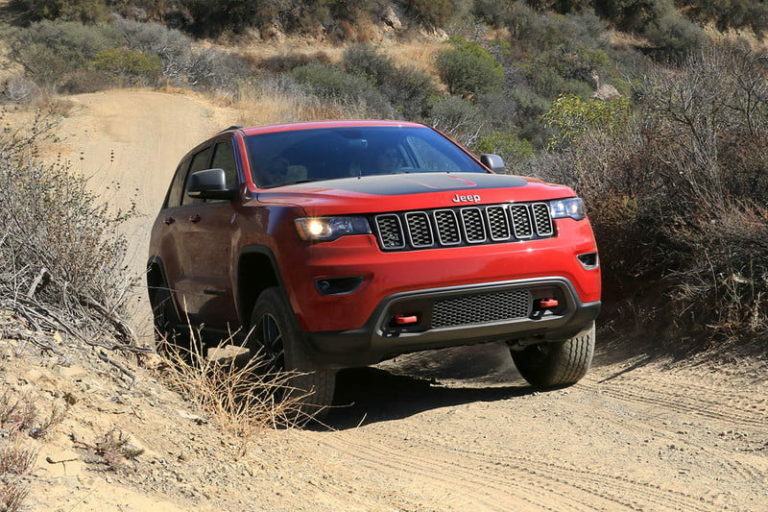 Finally, there are the Quadra-Drive II powertrain upgrades that beefs up the Trailhawk’s rear axle and adds an electronic limited-slip differential (LSD) that can proactively transfer up to 100-percent of available torque between the left and right rear wheels if slip is detected. Between the center diff and the rear LSD, the Trailhawk could potentially send all 260 pound-feet of its torque to just one of the rear wheels if the other three are slipping. In addition to the Selec-Terrain traction control systems, the Trailhawk is also outfitted with Jeep’s Selec-Speed Control systems which are basically really low-speed cruise control that help the SUV to maintain rock-steady speed control when ascending or descending tricky or severe slopes. Rounding out the electronic offroad upgrades is the Quadra-Lift air suspension with ride height adjustment. (There are a lot of “Quadras” and “Selecs” in this feature set.) In its tallest “Offroad” setting, the ride height raises to 10.8-inches. Combined with the Trailhawk’s shortened overhangs, the SUV’s approach angle also grows to 25.7-degrees with a departure angle of 27.1-degrees. Offroad mode is restricted to low speeds, but even the Trailhawk’s static ride height and angles are in the neighborhood with the likes of Land Rover’s Discovery. And when it’s time to get in or out of the SUV, the suspension can lower 1.6-inches below the static height when parked for ease of access or at low speeds for ducking under low garage ceilings. Not all of the upgrades are electronic. Up front, there are bright red tow hooks which can be used for pulling fellow trail riders out of tight spots (or getting pulled out yourself). Beneath the chassis, skid plates for the front suspension, fuel tank, transfer case and underbody protect the SUV’s sensitive bits when crashing over logs or stones. The hood graphic isn’t just for style, Jeep claims this matte black design also reduces glare bouncing up off of the hood, sort of like a football player’s eye black. Finally, the trailer tow group is also standard with all of the cable connections, hookup points and auxiliary cooling most will need for hauling. So far, so good. We’ve made it all the way into the cabin without any real complaints. The Jeep’s cockpit is pretty nice — a bit plasticky here and there, but by and large it’s well constructed and pleasing to both the eye and hand. In the center of the dashboard is the 8.4-inch Uconnect infotainment system. This rig isn’t perfect, but I still really like its usability and available features. For starters, navigation is handled by Garmin software which features excellent routing, responsive and crisp maps and fantastic voice recognition software. The nav is wrapped in an interface that itself is easy to navigate with customizable shortcut buttons along the bottom edge of the screen that guarantee you’re never more than a tap or two away from any part of the menu system. The usual suspects of modern sources are all here — Bluetooth, USB/iPod, terrestrial and satellite radio and more — and the hands-free calling system can read aloud inbound texts or auto-respond with customizable “do no disturb” messages. Additionally, Uconnect features Wi-Fi hotspot capability and a limited in-dash “app store” for adding integrations with select third-party services. App and smartphone integration is one of Uconnect’s weak points. Android Auto and Apple CarPlay are not supported, which remains a huge disappointment. However, I found that Uconnect’s core feature set and excellent onboard voice command worked well enough to make the omission sting less so. Aside from occasionally queueing up podcasts in my favorite, but unsupported, podcast app, I almost never found myself tempted to reach for my phone. What surprised me the most about the Jeep Grand Cherokee is how regular it can be in daily driving situations. I could do without the “anti-glare hood graphic” but mostly the aesthetic is understated. Even the red tow hooks don’t draw too much attention away from the mature design. Our example was also outfitted with a solid Jeep Active Safety Group ($1,495) suite of driver aid technologies that made commuting a bit less painful. The group adds adaptive cruise control that works in stop and go traffic as well as automatic forward collision mitigation braking. Forward looking cameras power the LaneSense lane departure warning system with lane keeping assist, which alerts the driver when unintentionally drifting out of their land and coaxes the SUV back into line with a bit of electric power steering assist. Finally, the safety suite adds semi-autonomous parallel and perpendicular parking assist. At the touch of a button, this system can scan the roadside using ultrasonic sensors for a parking space the Jeep will fit into. Once one is found, the driver is alerted to shift the SUV into reverse and let go of the steering wheel. The human maintains control of the accelerator and brake pedals, but the Jeep will then steer itself into the selected space. With the aid of the standard rear cameras, you could do it yourself, but the computer aided steering is adds a huge convenience boost. It’s a rough and tumble kind of SUV, but the 2017 Jeep Grand Cherokee Trailhawk has brains to go along with its brawn. From powertrain technology that saves fuel to smart, low-frustration cabin technology to fairly advanced available driver aid tech, the Trailhawk is as good a daily driver as it is a weekend warrior. Starting at $43,095 for the Trailhawk model, it’s not an inexpensive vehicle, but it’s a massive value if you think of it as the frugal driver’s Land Rover Discovery. Both vehicles have legendary offroad reputations that they live right up to. 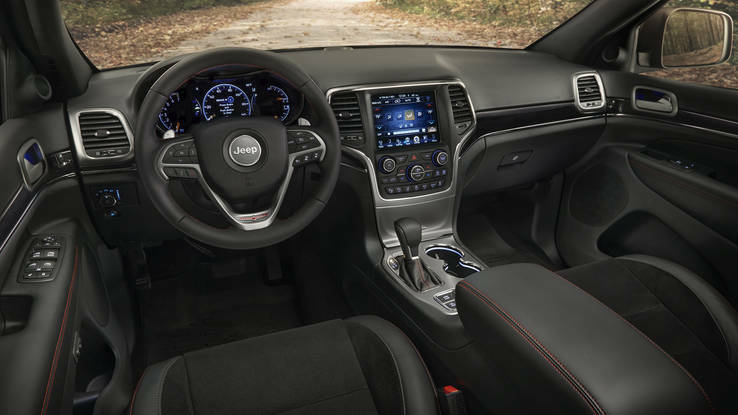 The Trailhawk’s interior feels a lot less luxurious than the Disco’s and it’s got fewer bells and whistles, but the Jeep is a much less expensive vehicle and the difference in comfort isn’t as vast as you may think, especially considering how much more I preferred the Uconnect tech to the Rover’s InControl Touch Pro. As tested, our loaded up Trailhawk stickers at $49,275 including destination charges and options, but before incentives. At that price, the Trailhawk feels like the sort of SUV that you can and should actually use offroad without feeling too precious about it. So go ahead, get it dirty, really scuff up those skid plates and try not to scoff too hard at those shiny luxury SUVs you pass on the way back home.